Discover how to convert your Scentsy night light into a tabletop warmer. It's super easy to do but make sure you choose the right base or it's NOT going to work! First, make sure the night light you plan to convert is an authentic Scentsy warmer. Then, make sure you choose an authentic Scentsy tabletop base and that it's the correct tabletop base for your night light. Not only must the new base be an authentic Scentsy product, but it must also fit your specific night light type. Be sure to read the information below and it's probably easiest to just watch the video below. Skip ahead to about 1:35 if you only want to see the tabletop conversion portion of this video. First, verify if you have a glass night light warmer or a ceramic. The Ceramic uses a twist off plug attachment and the glass uses a screw on attachment. For the glass warmer choose the Tabletop Base for a Glass Night Light. 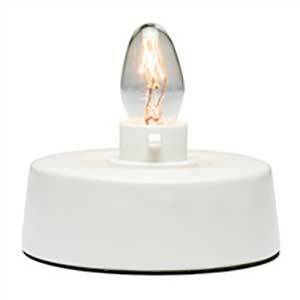 For the ceramic warmer choose the Tabletop Base for a Ceramic Night Light. If you're still unsure, see the video and compare it to your warmer. Place your order. Both types come with a brand new 15 watt bulb. Once you receive your new tabletop base, remove the light bulb and base from the box and screw the new bulb into the base. Remove the existing wall plug base from your nightlight. Screw in or twist your night light into the new tabletop base. Plug your new tabletop base into the nearest wall outlet, turn on the switch and you are all set! 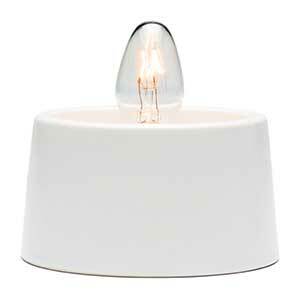 Why Your Would Want to Convert your Scentsy Night Light into a Tabletop Warmer? Basically, we can see two reasons why you might want to bother with converting your night light to a tabletop warmer. The biggest reason is, not all Scentsy night light styles are not available in the tabletop versions. There are a few matching sets, but mostly not. You might have a favorite night light in your bathroom that you would love to display in your living room, but there is no matching full sized warmer to buy. The other reason is simple economics. A tabletop base is at least half the cost of the full sized warmers. Personally, we don't think the tabletop bases are the most attractive and it does take away from the night light. However, for sentimental reasons, we do use one for one very special night light we wanted to place in our bedroom. See all our Scentsy warmers here! Should you have any questions or need some help with your order, please feel free to contact us by calling or texting Mary Gregory at 661-210-7617.